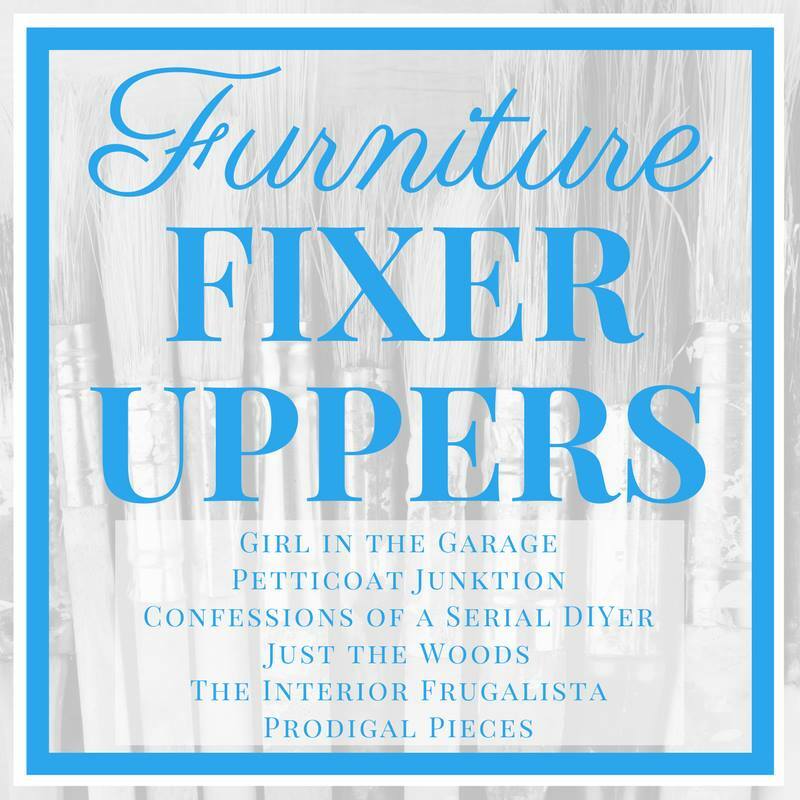 It's the fourth Thursday of March and that means it's Furniture Fixer Uppers day. I always look forward to this series each month and I had planned on sharing today's makeover with you last month. You may remember a cold knocked me flat off my feet so I put this labor intensive makeover on the back burner. 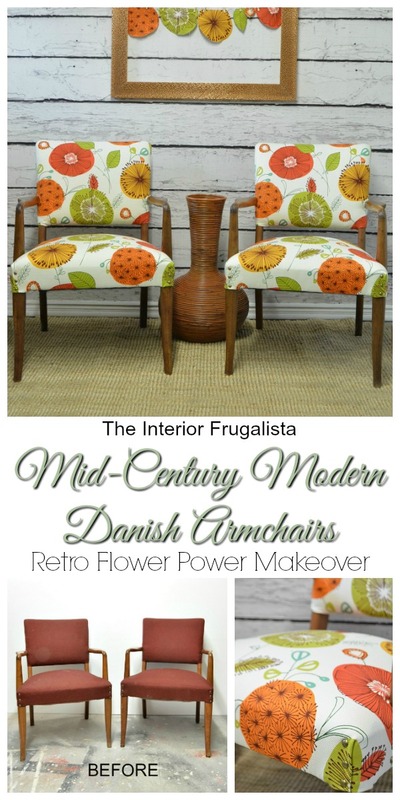 Well it's a new month and I still have that cold but I wasn't going to let that stop me from finally giving this pair of Mid-Century Modern Danish Armchairs a flower power makeover. There's a funny story about these chairs. We purchased them through a local online auction site and when picking them up discovered the seller was a cousin's ex-husband. That cousin was raised in our house, which we purchased from my Aunt and Uncle. Judging by the labels found under the chairs, they may have originated from this house (that hasn't been confirmed yet but is very likely). Talk about coming full circle. 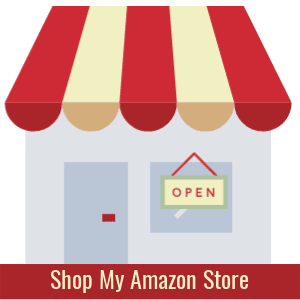 *This post contains affiliate links so you can find the products I used or recommend. See my disclosure policy. 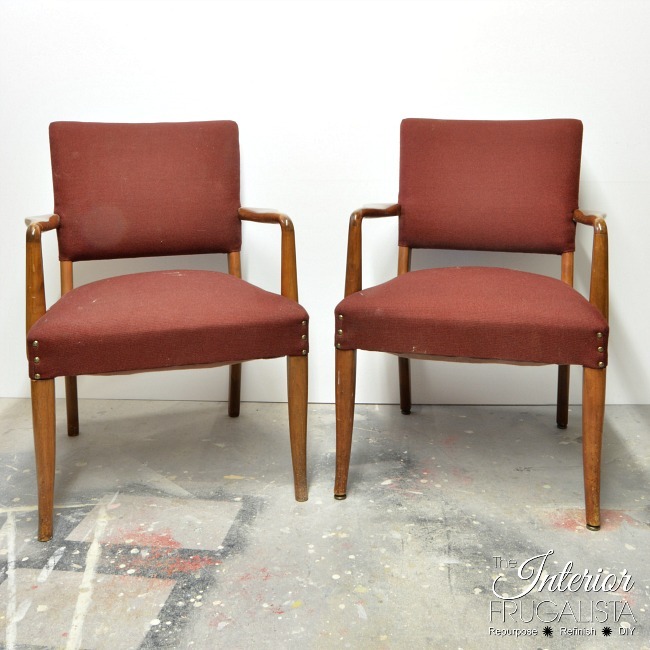 After removing the hundreds of staples (the worse part of reupholstery) on each chair along with the filthy dirty upholstery, the next order of business was to restore the worn teak. With 150-grit sandpaper, I was able to remove the surface scratches and even out the wood tones. Before you remove one staple, ALWAYS take close up photos of every angle, every fold, every joint in the old upholstery. Trust me, you will refer to these photos often when adding each new piece of fabric. Using a damp cloth I removed the dust and followed up with a tack cloth. 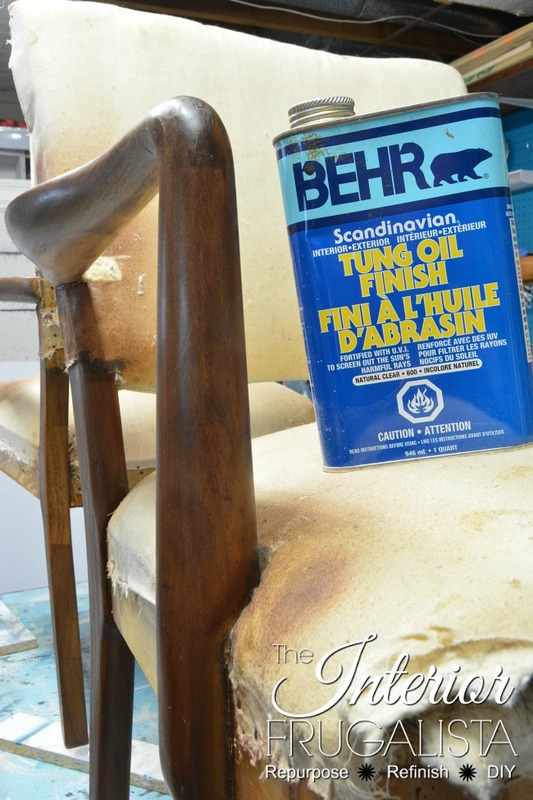 Next, using a lint free rag I applied Scandinavian Tung Oil (*affiliate link). I was a little concerned about the oil because judging by the amount of dust on the top of the can, this stuff had been in the workshop for probably over a decade. I was amazed how after just one coat it renewed the luster of the wood. I applied a second coat just in the places where the wood was worn. 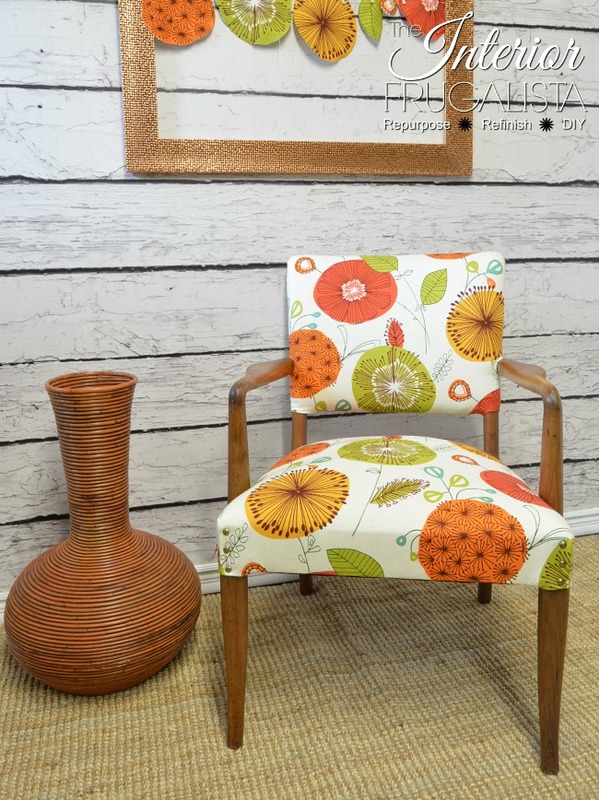 When I saw the bolt of fabric at Fabricland (Canadian retailer), I instantly knew it was THE fabric for these chairs. 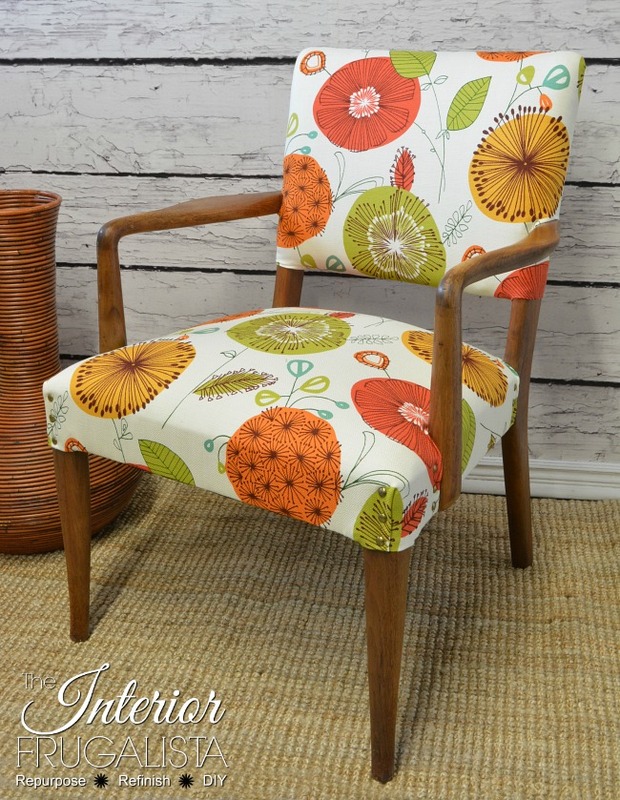 I just love the bold colors and floral print that just screams retro. For your convenience, should you want to purchase it, pictured below is the fabric label. 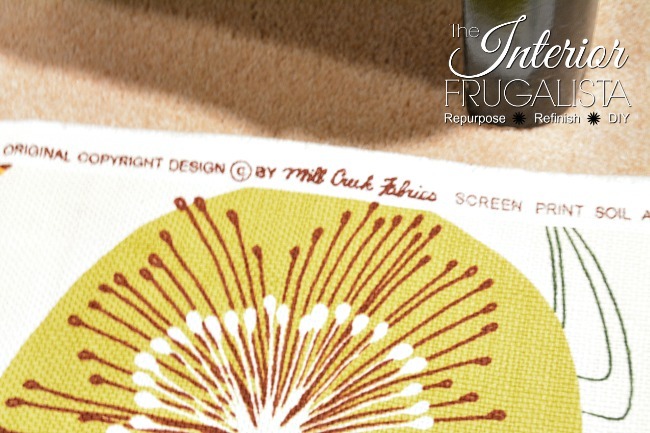 When purchasing fabric with a print, remember to allow for pattern repeats. Because we were doing two chairs and wanted the pattern repeats to be echoed on each chair, I purchased 4-meters (4.37 yards). 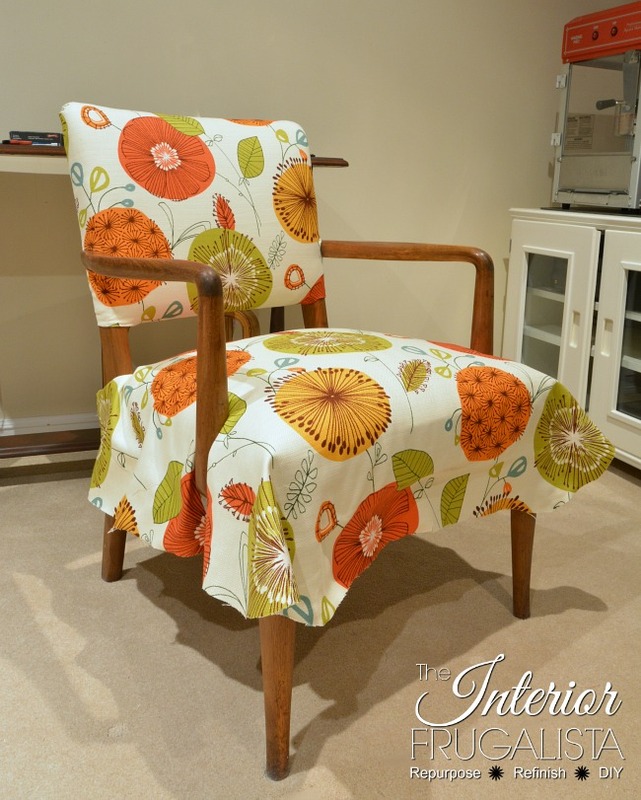 I was hoping to have fabric left over to sew two matching pillows but unfortunately had just enough for both chairs. Keep this in mind should you want to sew cushions. As I mentioned earlier, the original fabric was filthy dirty. Instead of using it for the pattern pieces to cut the new fabric, I traced each piece onto craft paper. I added an extra 4-inches all around each piece so there was room for error and labeled them accordingly. 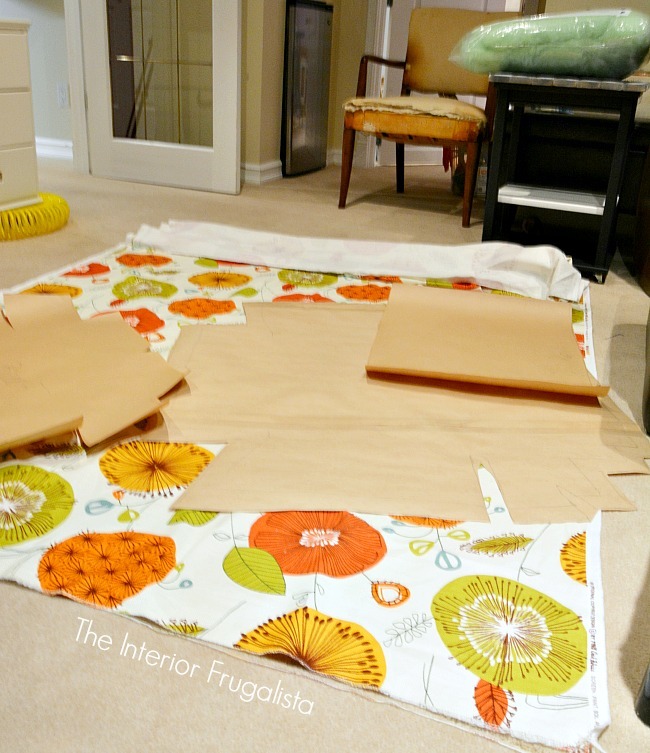 With the fabric spread out on the floor, lay out the pattern pieces so you get the exact same pattern repeat for each piece per chair. 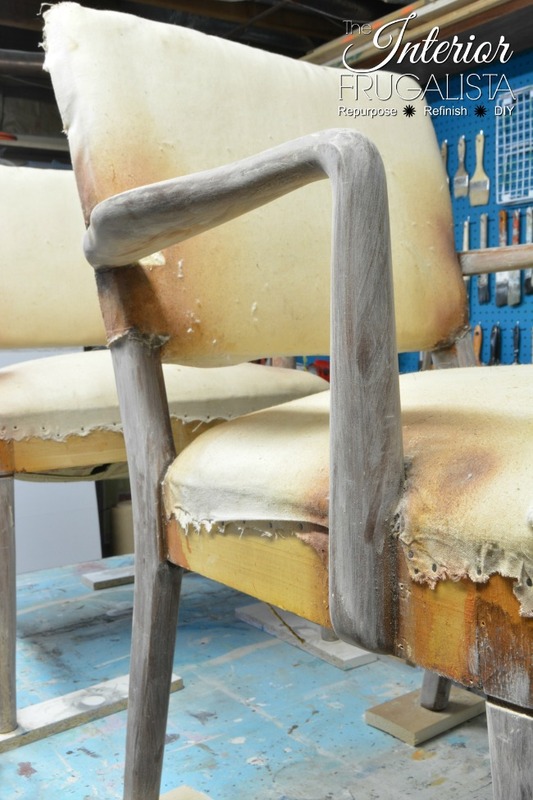 When removing the original upholstery, label each piece on the back with a marker. They will become your pattern for cutting the new fabric. Once the pattern pieces were laid out and we were 100% certain the pattern repeats were identical for each chair, we placed weights onto each pattern to hold the fabric in place while cutting. You could draw the pattern using tailor's chalk or a pencil but this method is much quicker. Thankfully the original stuffing and cotton batting were in good condition. All we had to do was replace the dirty muslin with new batting. If you don't do a lot of upholstery projects, a heavy duty stapler (*affiliate link) does the task just fine. Electric staplers (*affiliate link) make the task much easier and are a great option if you tackle a few upholstery projects. If you're like us and do a fair bit of upholstery, a Pneumatic stapler (*affiliate link) is a game changer! While the compressor may be loud and annoying running in the background, the time you save makes the noise well worth it. 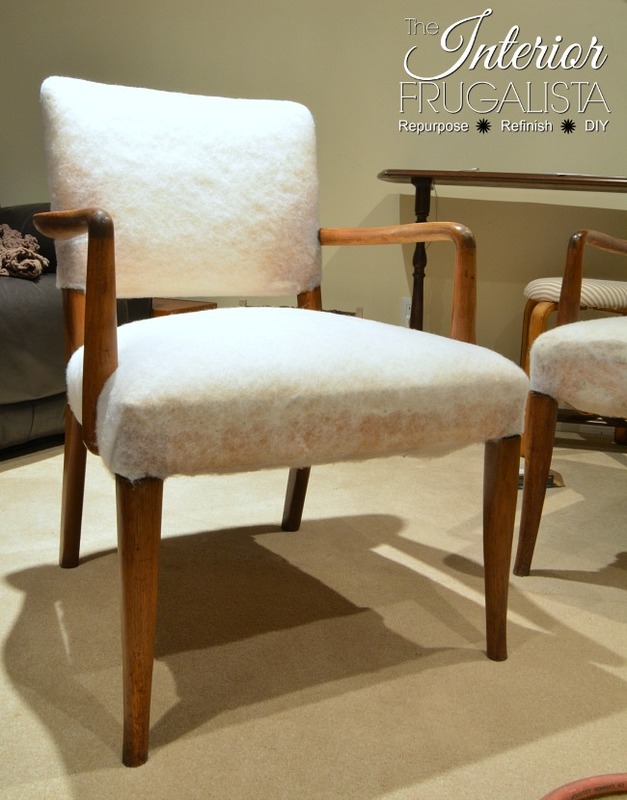 Both chairs were upholstered at the same time to ensure the patterns on each piece lined up exactly the same, starting with the backs. 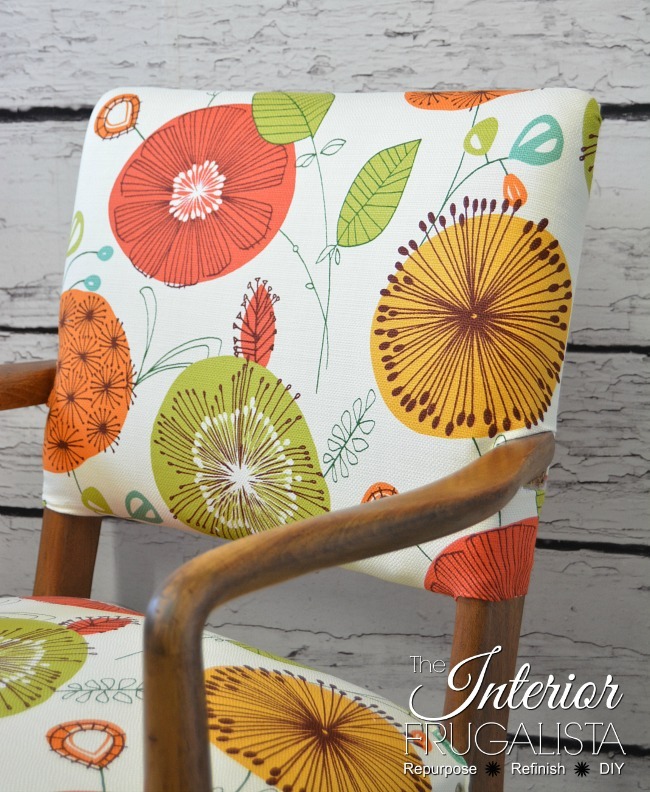 Next, the seats were upholstered, lining up the pattern repeat to the backs (see the first photo in this post). Start by putting a staple in the center of top or bottom. Pull the fabric taut (not too taut that it distorts the pattern) and staple the opposite center. Repeat on each side. Work your way around the entire piece. Note: This is the step where you will be referring to those photos of the original upholstery so you can see how the original folds were on the corners. 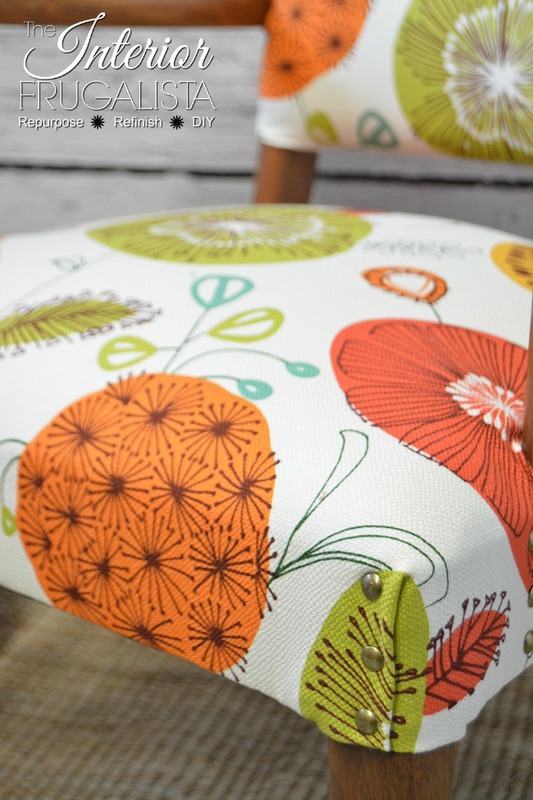 I highly recommend this book by Cherry Dobson if you are just learning how to upholster. Rarely do we tackle an upholstery project without it being by our side. On each fold, three Antique Brass Upholstery Tacks (*affiliate link) were added for a total of 18 per chair (as per the original upholstery). 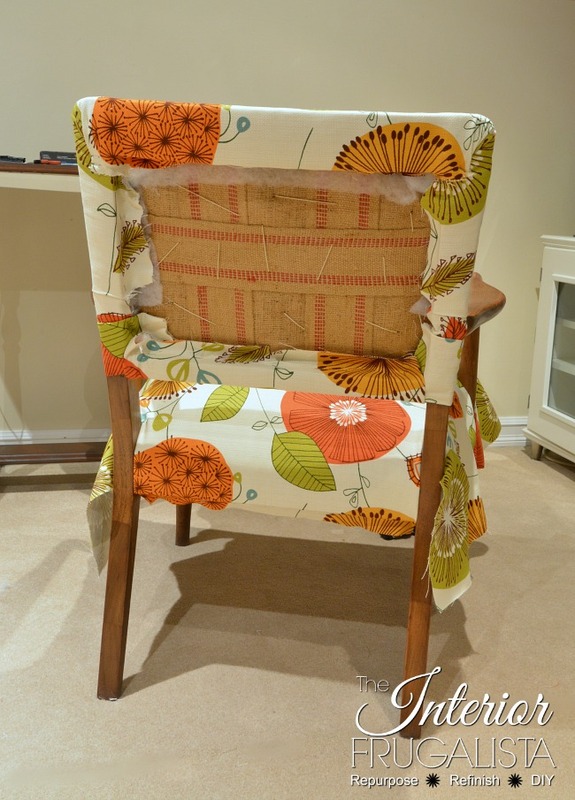 I'm thrilled with how the chairs turned out - they are just like I had envisioned when picking out the fabric. 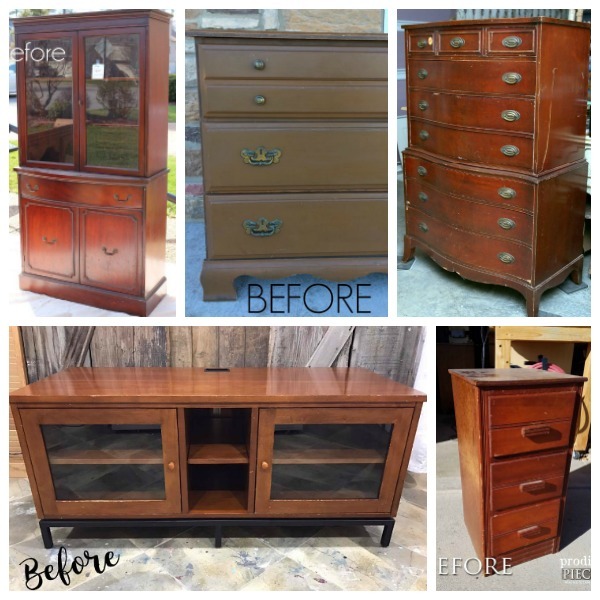 If you haven't heard about this series, six blogging friends who have a passion for rescuing furniture that has seen it's better days, come together to bring you six furniture makeovers that include tutorials and helpful tips. 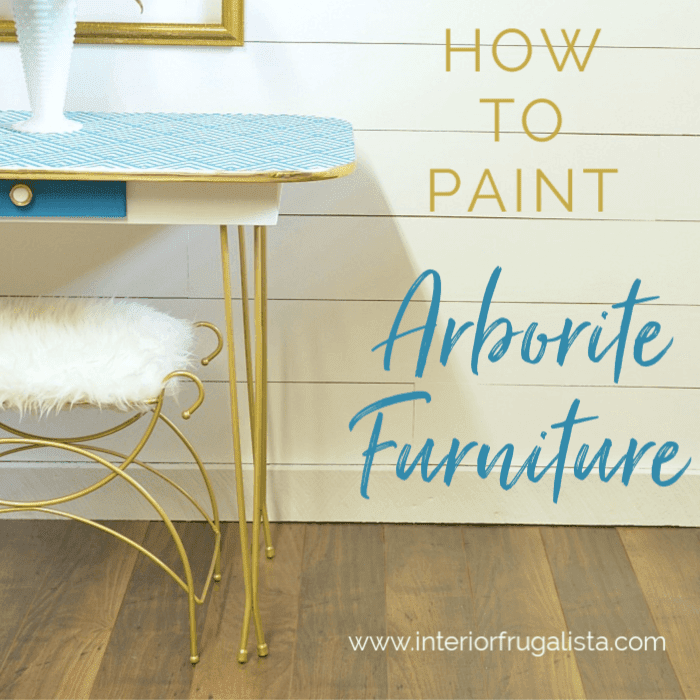 The goal is to inspire others to breath new life into dated furniture at a fraction of the cost of replacing it with something new. If you missed the challenge in February, I transformed a set of Turned Leg Nesting Tables with Jacobean Floral stenciled tops. 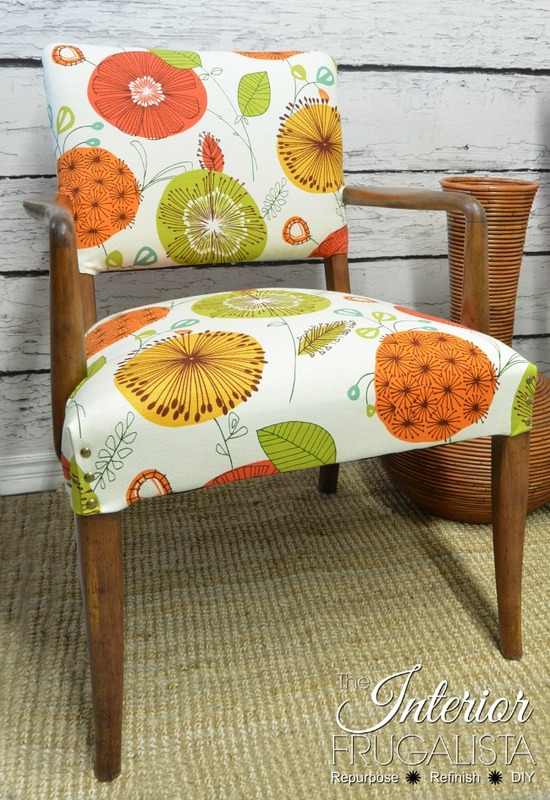 I'm happy to report these Mid-Century Modern Armchairs sold quickly at a recent Spring Market and I could have sold them ten times over because people were just digging that flower power fabric. Surprisingly, the Funky Mid-Century Modern Bar makeover for January's challenge did not sell at the market. 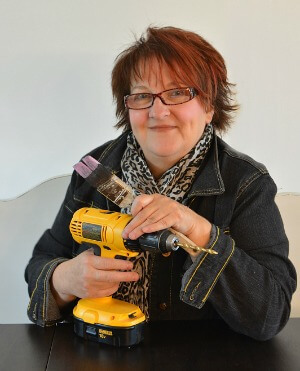 Are you as excited as I am to see how the talented gals in this group transformed these Fixer Uppers? 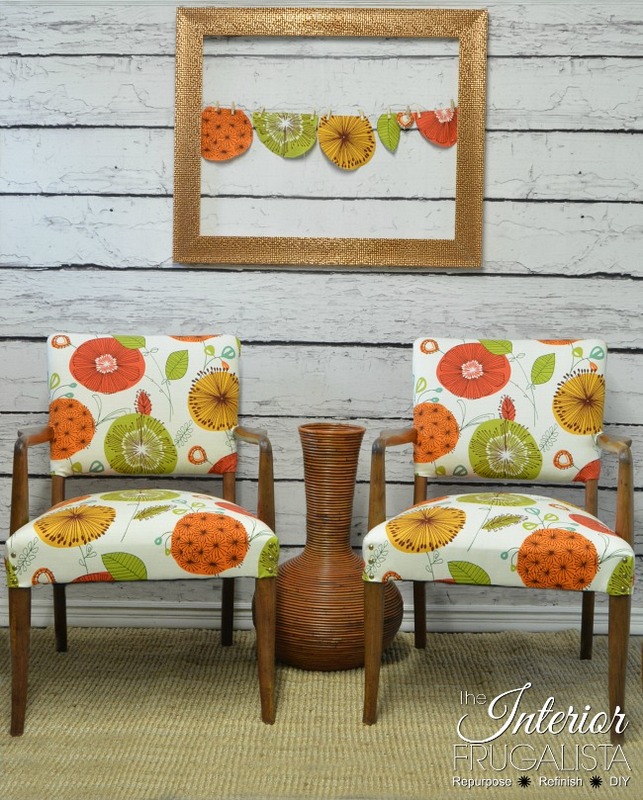 You will find the MCM chairs shared at these fabulous LINK PARTIES. Marie these chairs are awesome! I am not usually a fan of MCM furniture but these may have just changed my mind. They are stunning! Thank you so much Susan! I wasn't a fan of MCM furniture either until I was commissioned to paint a piece and was hooked. 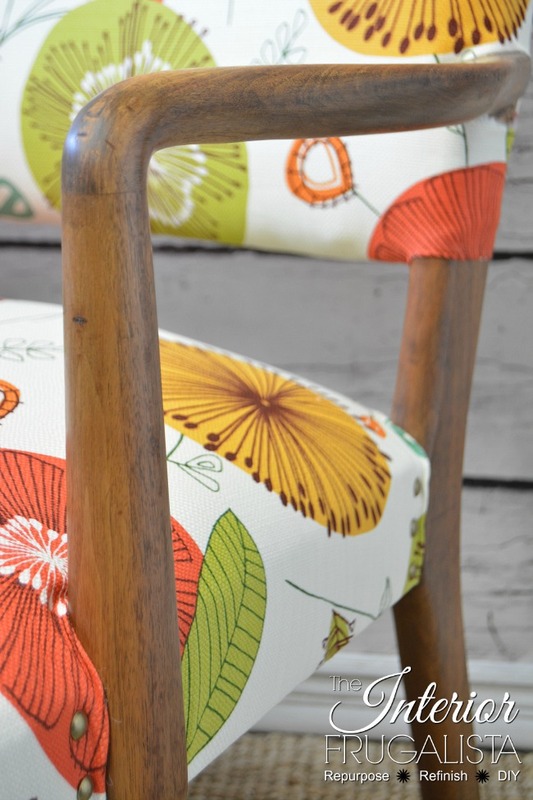 The retro fabric on these chairs steal the show. I was thrilled to see them go to a young couple furnishing their first home. These turned out great but....I am wondering how you did the back of the chairs. You show a pic of the backs as you are working on them but, not after they are entirely covered. How did you finish up the back of the backs? Inquiring minds would love to know. Dang, I didn't realize I hadn't photographed the backs until you pointed it out. We wrapped fabric over a piece of rigid cardboard (not corrugated) cut to the shape of the chair back and hot glued it in place. Foamboard or thin wood could also be used but oftentimes the chairs will already have a rigid back for this purpose. They are normally attached with hot glue or upholstery tacks. I hope this helps, Renee!